WE WILL FIND THE BEST SHIPPING RATE AVAILABLE TO KEEP YOUR PACKAGE FROZEN. Welcome to the ElkUSA elk sausage store. While elk sausage is not our primary product (Frozen raw elk and buffalo are), we have been steadily increasing our elk sausage selection so as to include a good variety of delicious USDA elk sausage products. Our new elk sausage-maker has a strong German heritage and has created numerous award winning sausage recipes some of which have been incorporated with elk meat as the primary ingredient. A strong line of elk Italian, German and Mexican-spiced elk dinner sausages are excellent. 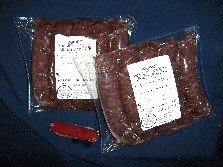 We have also created some of the best elk summer sausages around with various unique elk sausage recipes. Breakfast sausage and elk sausage snack sticks round out our offering. Please feel free to call 888-338-4581 with all your elk sausage questions. We would be glad to help! This is UNCOOKED SAUSAGE, must be cooked prior to eating! Price per pound / pack. ♦ Elk Sweet-Mild Italian link Sausage ...1/5# Links (~1 lb. packs) MUST BE SHIPPED FROZEN. 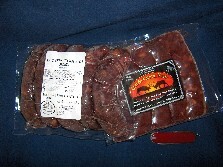 ♦♦ Elk Spicy-Hot Italian link Sausage ... 1/5# Links (~1 lb. packs) Rich's Choice MUST BE SHIPPED FROZEN. 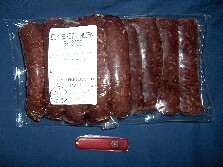 ♦ Elk German link Sausage .OUT OF STOCK.. 1/5# Links (~1 lb. packs) MUST BE SHIPPED FROZEN. 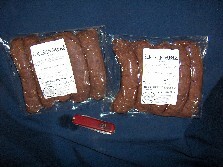 ♦ Elk Andouille link Sausage ... 1/5 lb Links (~1 lb. packs) MUST BE SHIPPED FROZEN. ♦ Elk Cheezzy Italian link Sausage ... 1/5 lb Links (~1 lb. packs) MUST BE SHIPPED FROZEN. 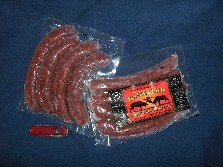 ♦ Elk SPICY Cheeze link Sausage ... 1/5 lb Links (~1 lb. packs) MUST BE SHIPPED FROZEN. (Alcohol evaporates upon cooking) (1 lb., 5 link packs)MUST BE SHIPPED FROZEN. 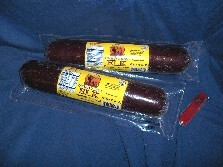 ♦♦♦ Elk Chorizo link Sausage ... 1/5 lb. Mexican inspired HOT Links (~1lb. packs) MUST BE SHIPPED FROZEN. No Nitrates, NO fillers, No pork! Mild Elk Breakfast Sausage ... with pork added but NO MSG or nitrates (1 lb. packs) MUST BE SHIPPED FROZEN. 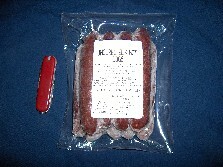 No Picture Available ♦ HOT Elk Link Sausage ... with pork added but NO MSG or nitrates (1 lb. packs) MUST BE SHIPPED FROZEN. ♦ Elk Sausage Links ... with +3% pork added but NO MSG or nitrates (8 oz to 14oz . packs) MUST BE SHIPPED FROZEN. 2 3 4 5 6 7 8 9 10 OUT OF STOCK minimum order 2 lbs. 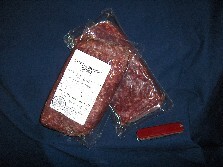 ♦ Midwestern Elk Summer Sausage ... a very tasty treat, pork added 10 oz. chubs FULLY Self Stable with Nitrates added. CAN BE GROUND SHIPPED, Does not need to be frozen. 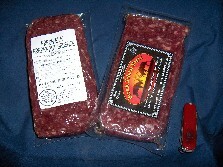 ♦ Midwestern Elk Summer Sausage ... a very tasty treat, pork added 20 oz. chubs Fully Shelf Stable with Nitrates added. CAN BE GROUND SHIPPED, Does not need to be frozen. ♦ Hickory Smoked Sausage Sticks, GREAT for small gifts, or snacks. 1 oz. pack minimum order 6 sticks Shelf Stable with Nitrates added. CAN BE GROUND SHIPPED, Does not need to be frozen. ♦ Hickory Smoked Chipolte- Flavored Sausage Sticks, GREAT for Little delicious GIFTS, or snacks. 1 oz. pack minimum order 6 sticks Shelf Stable with Nitrates added. CAN BE GROUND SHIPPED, Does not need to be frozen. or $22.00 per BOX up to a 70# box. 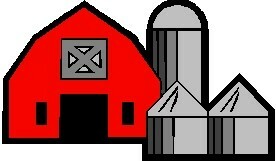 or Email us for questions regarding any of these Products.